A.J. 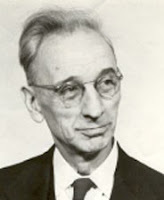 Muste, who advised Martin Luther King, Jr. on issues of pacifism and nonviolence, is probably not well known outside the peace and justice community. Born in 1885, he was already "old" at the time of the Vietnam War, and had been promoting nonviolence as a way to resolve human conflict since before World War I.
I was "young" in the 1960's, in a completely different generation, but A.J. Muste was an inspiration to me. He could be an inspiration to you, too. I encourage you to read his books, and to read books about him. The A.J. Muste Memorial Institute, to which I contribute, is attempting to carry on his message. Whether you think of it as the "Golden Rule," or as the "Categorical Imperative," the idea that we should "do unto others as we would like them to do unto us," is more than a moralistic advisory. If our individual and collective actions "create" the world in which we most immediately live (and this is something I strongly believe), then it follows that we cannot "create" something that is different in its nature from the materials and techniques we employ in creating it. Ends and means are inseparable, and to recite Muste's most famous statement once again, "there is no way to peace - peace is the way."